Future undergraduates were today engaged in a further day’s practice to be whiny university students by continuing to complain that one of their A-level exams may have been more difficult than expected given the last several decades of record pass rates. 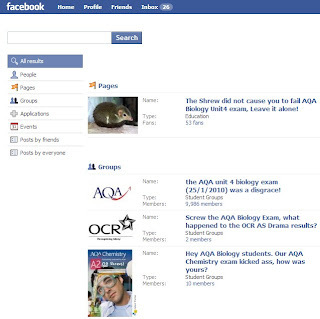 The complaints about the AQA Biology Unit 4 paper allege that the questions bore no resemblance to the curriculum that the pupils believe that they might have been taught in between texting each other, and indeed bore no resemblance to past papers. The complaints are being collated on the 21st century’s medium of choice for ineffectual whining, the Facebook group, where pupils claim they were screwed by shrews. The children are complaining about the obscurity of the questions on the OCR Biology paper and are also complaining that the questions were not clear as to the level of knowledge they were required to demonstrate. Many of the examinees were worried that a bad result on this exam would leave them at a disadvantage when competing for places at universities with other students who are likely to hold at least 12 A Star passes at A-Level if previous years are any indication. Not only do you know nothing about the exam or the examining body, you choose the most stupid responses from those who seem to not be able to even spell. Take it from students at a high acheiving school whom almost all will be leaders in their fields and a large proportion of which have been offered places at oxford and cambribge, this exam was a discrace. Biology, out of all of the sciences is mostly geared towards factual recall and interpreting data. All the biology students at my school were pushed to learn all of the content in the textbook with almost no lesson time left for practical experiments. When this test simply omitted great swathes of information that we were meant to know, those of us who'd worked hard throughout the year were spun into dispair as it felt as though we had simply wasted our time and may as well had just 'watched a whole series of Scrubs and some Grey’s Anatomy' and turned up to the exam drunk. There would not be complaints if the test was hard, and testing of the knowledge we had learnt, as this is why tests were designed. Instead the people who designed the paper included things which even teachers with almost 20 years worth of experience had to look up on the internet and some not even finding the answers to in that vast pool of conglomerate knowledge leaves one with the conclusion that the test was not difficult at all, instead it was simply unfair and tested on things that were not included in the textbook 'exclusively endorsed by AQA'. So yes, the student body who sat the exam are having a moan, and rightly so, as the future doctors, and other professionals' degree places depend on these exams. How are tomorrows professionals meant to be selected carefully when this is the best biology 4 exam that AQA can cough up? It's disgraceful. Excellent piece as the first comment proves. every student has to pass the test before entering the university. proofreadingservices scholarship can help to cope with it and make you chances higher!